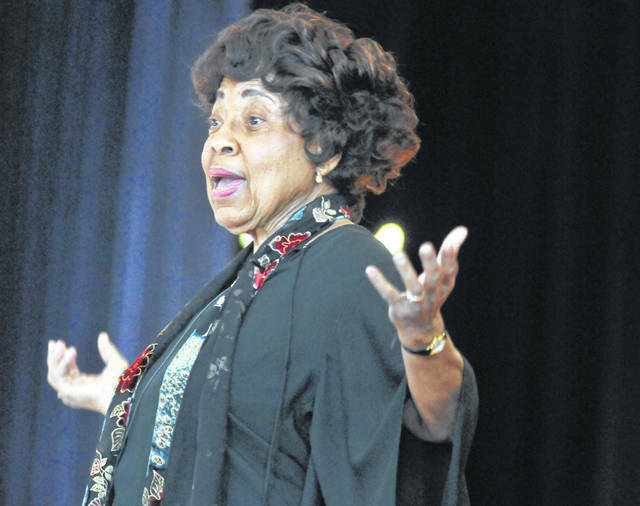 This 2014 photo shows Civil Rights leader Dorothy Cotton, speaking during VSU’s Founders Day celebration in Chesterfield County, Va. The Southern Christian Leadership Conference announced that Cotton died Sunday. ATLANTA (AP) — Dorothy Cotton, who worked closely with the Rev. Martin Luther King Jr., taught nonviolence to demonstrators before marches and sometimes calmed tensions by singing church hymns, has died. She was 88. Cotton died Sunday afternoon at the Kendal at Ithaca retirement community in New York, said Jared Harrison, a close friend who was at her bedside. Harrison said she had battled illnesses recently but didn’t specify a cause of death. Cotton was among a small number of women in leadership positions at the Southern Christian Leadership Conference during the civil rights era, and she led the Atlanta-based civil rights group’s Citizenship Education Program. “She had a beautiful voice, and when things got tense, Dorothy was the one who would start up a song to relieve the tension,” said Xernona Clayton, who was King’s office manager in Atlanta and organized protest marches and fundraisers. Cotton became one of King’s closest colleagues and worked at the SCLC for more than a decade. Cotton also commanded respect from her male counterparts within the group, said Bernard Lafayette Jr., a longtime civil rights leader who is now chairman of the SCLC’s national board. When King and others ventured to parts of the Deep South that had a reputation for violence against blacks, Cotton was fearless, Lafayette recalled in an interview. A key focus of Cotton’s work was voter education, and teaching people how to read ballots, how to vote and the importance of voting, said Edwina Moss of Cleveland, Ohio, who was civil rights leader Andrew Young’s administrative assistant. Cotton remained active in civil rights and education after King’s death, later serving as an administrator at Cornell University in Ithaca, New York. During a commemoration of King’s death in 1993, Cotton said that people need to take responsibility for carrying on the mission of racial equality. Cotton was born in Goldsboro, North Carolina. She and her three sisters were raised by her father after her mother died when she was very young, according to Cotton’s online biography at the Dorothy Cotton Institute. She attended Shaw University in Raleigh before earning a bachelor’s degree in English and library science at Virginia State College in 1955. She earned a master’s degree in speech therapy from Boston University in 1960. She met King when he preached at the church she attended in Petersburg, Virginia, and was invited shortly thereafter to join the staff at the SCLC. Harrison, who worked with Cotton at Cornell while she served as director of student activities, said a small private burial and larger public memorial were being planned in Ithaca but details hadn’t been finalized.